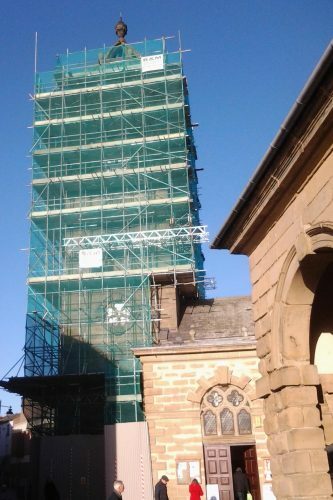 The scaffolding around the church tower is now almost completed, it is an extremely rare sight and will probably not be seen again for at least another century! It is part of the £350,000 final phase of the fabric repair works that are currently being undertaken to this Grade 2* Listed Building. In addition to the repairs works to the tower, stonework repairs will also be carried out to the on the west, north and east elevations of the church building together with renovation work to windows, the north aisle roof, rainwater pipes and east end drainage. The costs will be met from a £174,200 grant from The Heritage Lottery Fund with further grant awards from National Churches Trust, WREN Heritage Grant, The Garfield Weston Foundation, Allchurches Trust and Yorkshire Historic Churches Trust. A substantial contribution has also been made by St Giles Church.